Obvious? Perhaps. In the whole of Satyajit Ray’s landmark 1955 film Pather Panchali, that is the closest thing we find in the dialogue to a “message” — and it’s pretty on-the-nose. Still, we shouldn’t rely on what the characters say to tell us what the movie is about. The wisdom of this movie is in the silent gazes of its characters, who are often shown staring — staring at one another, staring into space, or in the case of the ancient grandmother, staring into increasing darkness. Despite what that head-shaking neighbor wryly observes about the suffering and the stuck-ness of the movie’s central family, Ray reveals enough natural beauty in this place of rot and ruin to make Terrence Malick weep. While the father’s gaze is turned to faraway opportunities, while the mother’s gaze stares into all that she does not have, and while the daughter’s gaze looks increasingly downcast because of her dwindling hopes, the young boy’s eyes are wide open, soaking in the wonder of what surrounds him, the occasions for joy, the horrors of loss and death, the lies that people tell, the secrets that they keep, and the sinister advance of advanced and electrical foreign cultures. He is the one who makes the strongest impression. He is the one, we suspect, in whom Ray sees himself. The boy’s eyes are his cameras. Where Danny Boyle (God bless him and his boundless enthusiasm) couldn’t help but exaggerate India’s appearance in Slumdog Millionaire — turning so many scenes into carnivals of color and style, dressing the movie up in flamboyant exaggeration — Ray’s approach is to attune our eyes to what he finds at hand, to find beauty rather than impose it. I am so glad that I finally sat down to watch this film all the way through, and I’m looking forward to the rest of the trilogy. 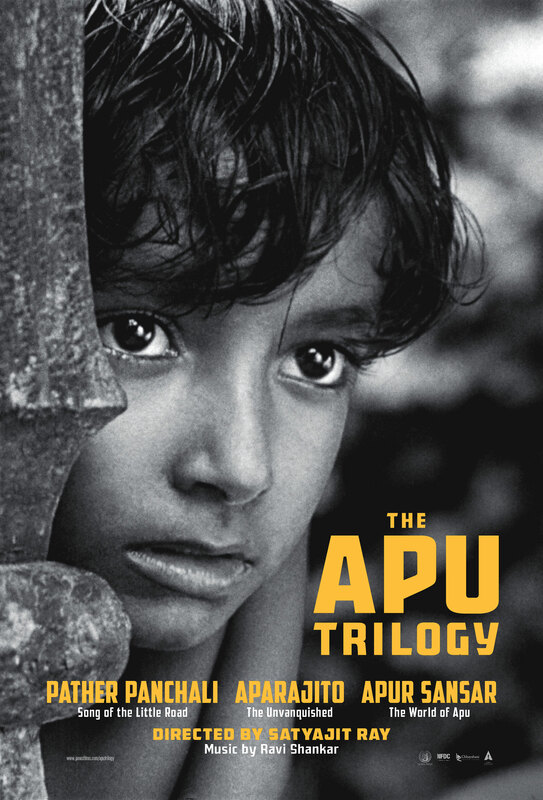 You can watch Pather Panchali as a heart-smashing drama. You can watch it as a coming-of-age tale, in which a young boy’s wide eyes become our own. You can read it as a progression of Italian neorealism, as a variation on Ozu’s sense of composition, or as a precursor to the nature-versus-technology tensions of David Lynch. The smooth skin of a child; the exquisitely detailed skin of an old woman. Electrical towers stark and looming like the aliens from War of the Worlds. Billowing smoke from a train. Water striders making giddy circles on still water. A comb through wet hair. Bogwater, swallowing a long-kept secret. While Ray never denies that this family needs hope and provision, his imagination casts a wide enough net to help us see that their world of poverty is not a dead end, but is rich with beauty. They may rightly hope for escape, but we will want to go back to this place again and again.